A scripted hair shaped like a tree. 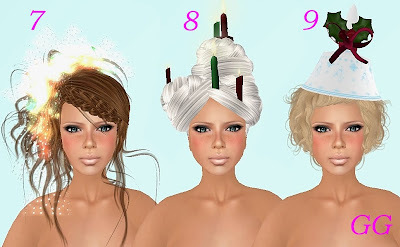 One of my fellow bloggers, G4B, suggested I do the Twelve Hairs of Christmas however it seems jingles are not my talent so on to the details. It will take a fair bit of creativity to work these styles into your roleplay but maybe you can use them in a holiday scene or OOC event. The skin in all the pictures is “Kalista POE3 natural” the Peace on Earth Hunt prize at Rockberry. 12) “ Ear muff with Moonlight ~ Blonde” and “Moonlight ~ Red” are part the in store group gift at Argrace. Includes 9 colors with and without ear muff option. Happy Holidays from the Themed inSL team. If you have a blog about your SL Gor roleplay experiences, your Gorean sim, Gorean content you create in Second Life, or SL Gorean fashion consider signing up at http://slgorean.metavirtual.us/join.php. There are many SL Gorean bloggers out there both business and personal. It will be great to have them in one place. I believe non english blogs are welcome so I hope to see one of my favorite SL Gorean blogs called Silent Sky at http://kajirus.wordpress.com/ sign up if he returns to us. Thank you to Metavirtual.us for hosting and Elle Couerblanc of Elle's World for organizing this. From Neko to Bondmaid everyone needs winter accessories. Outfit and Accessories: "Blue Ice" Happy Holidays Hunt 10L at LouLou & Co. Skin: "Fusion Skin-Sunkissed-Frozen" Happy Holidays Hunt 10L at Tart. Hair: "Ann-Hair type-B size-S topaz" free gift on counter at Uncle Web. The Happy Holidays Hunt started on December 10th and runs until December 31. There are 96 stores participating and all hunt items cost 10L. Join the group called "The With Love From... Hunts" at any of the participating locations to receive a list of store landmarks and hints. Noe Designs has an unlucky chair and a lucky dip with various prizes that would suit characters in several different roleplay themes. There are four lucky chairs at Vixen Hair that rotate through the 7 new hairstyles. Outfit: "Samiii GREY" lucky chair prize from Noe Designs comes with a few mix and match skirt and sweater options, legwarmers and boots. Hair: "Sugar - Vanilla " lucky chair prize from Vixen Hair. Skin: "Uma Happy Holidays Hunt/Light" 10L hunt gift at ROCKBERRY. The Happy Holidays Hunt started on December 10th and runs until December 31. There are 96 stores participating including Rockberry, Acid & Mala, Tart, Nyte N Day and Ducknipple. All hunt items cost 10L. Join the group called "The With Love From... Hunts" at any of the participating locations to receive a list of store landmarks and hints. The starting location for the hunt is at Ispachi. Outfit: "Vilathea Pink" lucky chair prize from Noe Designs. Hair: "Jewel - Wheat" lucky chair prize from Vixen Hair. Skin: "Uma Happy Holidays Hunt/Natural" 10L hunt gift at ROCKBERRY. Outfit: "Kiremhyldr GREY SPOTTED" lucky chair prize from Noe Designs. Hair: "VIXEN - Lily - Cayenne " lucky chair prize from Vixen Hair. Skin: "Uma Happy Holidays Hunt/Tan" 10L hunt gift at ROCKBERRY.